Turmeric is being used for pain, inflammation, depression, cancer, IBD, diabetes and can even naturally whitening your teeth! With so much information on the internet revolving all around turmeric, it can be hard to decide how to use the spice. Is there a right way? Your whole food option is always best, which means utilizing turmeric in it’s most natural form (whole root or organic turmeric powder) – before it has been processed into extracts and isolates. Turmeric as a whole has countless natural health-promoting components including the much talked about ‘curcuminoids’. As far as supplementation goes; this tool is to ‘supplement’ an already healthy diet, not to replace the need for clean eating. We are only just beginning to understand all of the wonderful compounds in whole foods, how they work together and react in our bodies to support our health. So in my own opinion, we are better off consuming something in its natural whole and organic form opposed to some questionable extract in a capsule with possible added ingredients and a large list of manufacturing processes – we can’t ‘man-make’ our health by adding processed compounds to capsules and expect them to work as nature intended! When using turmeric, there are two essential things you must know – and then there is a third secret, which I will talk to you about today! First, you need healthy saturated FATS to absorb the active curcumin in turmeric, so always pair fresh organic whole root or organic turmeric powder with coconut oil, grass-fed butter, ghee or sustainable palm oil. Now, if you’ve studied turmeric in the past, you may have already heard of the benefits of using healthy fats and black pepper to increase absorption. Now the third and final secret for getting THE MOST benefit from this spice is to eat your turmeric FERMENTED. Yep, this takes things to a whole new level… and doesn’t have to be tricky. Fermenting can actually be quite simple, and a, study in the International Journal of Food Science and Technology found the bioavailability of curcumin is further increased when it is fermented . During digestion, curcumin transforms into different metabolites which can be more easily absorbed by the body, rather than the whole curcumin molecule. Not to mention, fermented foods also support and ease digestion. So if your GI isn’t in a prime state (you get bloated, have food intolerance’s, alternating constipation/diarrhea, acid reflux, and gas) using fermented turmeric takes any tax off of your digestive processes, and the beneficial compounds of turmeric can be easily absorbed in the bloodstream for your bodies benefit. Remember if digestion is not at its pride, and if you get bloated after eating – you are NOT effectively absorbing your nutrition from your meal. It is EASY to eat a healthy organic diet and still be malnourished if digestion is not prime. What’s the benefit of fermentation again? The art of food preservation has been practiced for thousands of years, the simple and natural process of lactofermentation encourages bacteria feed to feed on the sugar and starch within the food, creating lactic acid. The process preserves the food to extend shelf life (which is why it was so popular thousands of years ago) and the process also creates beneficial enzymes, b-vitamins, minerals, omega-3 fatty acids, antioxidants and various strains of probiotics. Fermentation has many benefits, lactic acid promotes the growth of healthy intestinal flora which builds a healthy gut and a strong immune system. Consuming fermented foods is an easy way to ensure you are getting the most nutritional value from your whole foods and superfoods by enhancing all of their beneficial properties and also increasing the nutrient value! 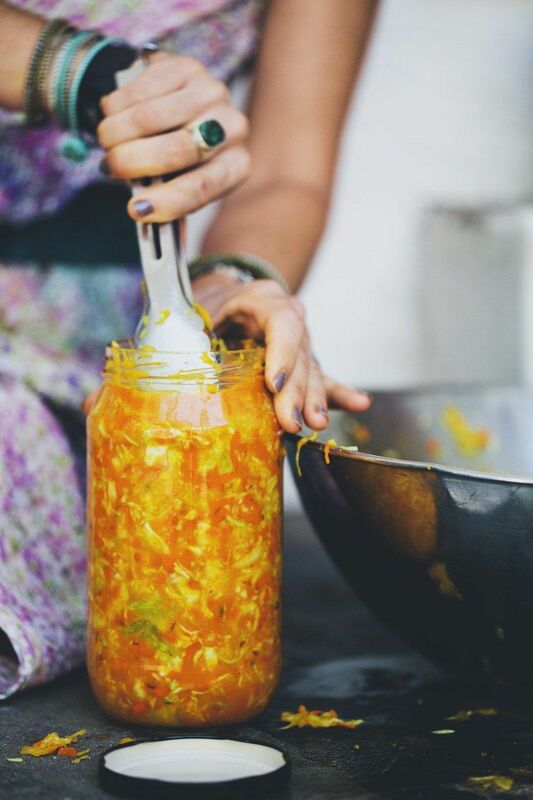 With a powerful herb like turmeric, getting the most from the whole root is ideal and having a few tablespoons of homemade turmeric sauerkraut a day is a great way to boost up your nutrient intake and take in the benefits of this root. Toss your cabbage into a large glass or stainless steel mixing bowl and sprinkle on the salt. Using gloves (unless you want to be a Simpsons character! ), begin to squeeze, knead and massage the cabbage until it becomes limp and juicy. This process breaks up the cabbages cellular structure! Getting the liquid out of the cabbage can take about 5 minutes of intense massaging. Now it’s time to pack the juicy cabbage into a large glass mason jar or a fermentation crock. Pack the cabbage down as tightly as you can, eliminating air bubbles. Use a sauerkraut pounder or improvise with a spatula or spoon to pack the cabbage tight so that the juice covers the cabbage completely. Your cabbage MUST be completely submerged in the juice, this is the most crucial step for a successful ferment. If using a mason jar, now is the time to screw on a kraut kap which is designed to create an anaerobic environment to ensure you do not grow bad bacteria. I have used regular mason jar lids before, however, the likelihood of the sauerkraut turning out bad is higher, with that being said: trial and error is often beneficial for beginners – proper equipment just makes it easier! Store at room temperature in a dark space to ferment. If you have a fermenting rock or another idea (such as a small mason jar filled with water) to keep the kraut weighed down, this prevents having to disturb the fermentation process by opening the lid and pushing the kraut down below the brine. Leave to ferment for at least 4 weeks and for up to 6 months, the longer you leave it the stronger it will be. You can then keep the kraut at room temperature and enjoy for up to 8-weeks, or you can transfer to the refrigerator which can increase the shelf life to at least 6 months, but up to 1-year! Some master fermenters believe using a refrigerator to store is unnecessary and affects the probiotics within , you can do whatever you are comfortable with. Don’t forget to drink the juice! This is your gut shot! Add it to your salad dressings or take it in a shot glass. If a scum is floating in the brine of your sauerkraut, simply spoon that sucker out. If solid materials aren’t resting below liquid, this is how the bad bacteria forms. Everything below the liquid will not be affected by any ‘mean’ microbes which may be multiplying above the liquid. Using a fermenting crock or mason jars with proper kraut lids eliminates the risk of microbial contamination. Fermentation is an art: if it smells off, and tastes off, it’s probably off… Then throw that kraut, out! This article was written by Nicole, a holistic nutritionist with a strong belief that it is possible for everyone to discover how good their body is designed to feel. Nicole works in partnership with her clients to achieve a lifestyle that is both balanced, fulfilling and nourishing. Go check out her fantastic blog with healthy recipes, or follow her on Facebook!